Quick And Easy Ways To Cut A Cigar Without A Cutter! How To Cut A Cigar Without A Cigar Cutter: There are moments when we might not have a cigar cutter on us but the urge to have a cigar is strong. There is nobody to blame, maybe you left your cutter back at home or maybe its just lost and you can’t seem to find it. At desperate times like these we start to wonder what other ways can there be to cut a cigar without a cigar cutter. Now as somebody who has tried his fair share of methods to cut a cigar without proper tools let me tell you it is way more efficient and easy to just use a cutter. I know you are probably thinking if I had a cutter why would I be on this page, it is not for you who just doesn’t happen to have it. It is for those who are just beginning or maybe think it will be easier to not use a cutter. It’s a tedious process and the chances of ruining your cigar are high when you are not using the proper tool. To make it easier I have already published my selection of best cigar cutters that you can check out. Let’s just say for whatever reason you don’t have a cutter with you and you really want to have a cigar right now, what can you do in such times? A lot of lighters have an inbuilt cigar punch tool which you can pull out and use. A punch is different from the cutters as they usually slice it off whereas punch creates a hole on the top for the smoke to pass through. 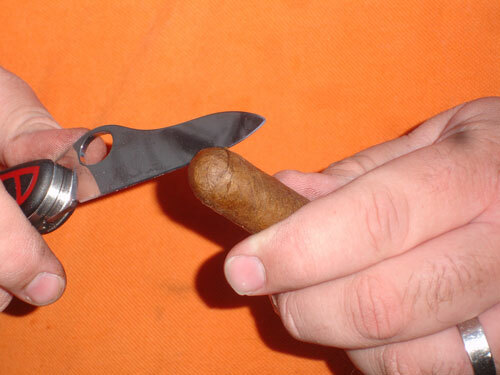 Cigar punches are also quite small and easy to carry, you can even get them in size of key chains. They are small usually around 6mm to 9mm round blades that are placed on the cap and twisted round into the cigar to create a hole. This leaves a nice small hole which provides adequate smoke to enjoy the cigar. To avoid any unnecessary hassles it is a good idea to use a sharp blade punch. Xikar is known for its quality and this punch is no exception. Simple to use, comes with easy cleaning mechanism that looks good in hand when using it. Perfect size to keep a few around in places where you might need them. Lets say you don’t have a good punch or any punch for that matter, then what to do? Well in that case find anything in your house that is sharp, small and round. A lot of members use a pen to poke a hole or if you are a golfer maybe you will have a tee lying around that you can use. Basic idea is to poke a small hole in the cap so the smoke can flow through. This might not be as effective as using an actual punch but you can always improvise and find ways to make it work. Let’s say you can’t seem to find a small sharp object, this method will probably take you to the dark ages then. So try to remain calm and patient. Since you couldn’t find anything to dig a hole with its time to do it with your nails. If you have long nails it will be much easier for you or else try to find someone with long nails. Using your nails carefully take a small part of the wrapper out from the top. You have to be careful so as to not break the entire thing. Once you have done that its time to start digging a small portion so as to create a hole or a budge. Be careful and do it slowly so that you don’t mishandle the top and ruin the whole thing. Once you have dug a small hole or budge clean any loose tobacco with your fingers and give it proper shape. Once you think it is enough and is ready to smoke go ahead and light it up. Knife is a way better option to go for then your nails. One thing to note in this is to check for the sharpest knife that you have. Knives usually are not a good idea to cut cigars because they are not that sharp but there are 2 ways in which you can cut a cigar with a knife that can minimize the damage and provide you with a good a experience. First way to use a sharp knife to cut through the cap the same way you would with a cutter. For support you can rest the cigar on a table or floor and with pressure from your hand hold it tightly in place while you cut through it with your knife. Now it is important to make sure the cigar doesn’t wiggle or roll around as that might make the cut at the wrong place and disrupt the airflow. It is important to keep it tight in one place and make the cut in one line, the same way we make a cut with a cutter. If you feel the knife is not as sharp to cut it properly then you can use the second method to make a safe cut which decreases the chances of ruining a cigar. The second way is to do the same thing that a punch would do but we will do it with a knife. Rather then cutting through we will make a small budge or cut on the cap, big enough to have the smoke flow thoroughly easily. The best way to do this is not have the hole be round but in a star shape such as this one *. This way there is less chance of you ruining the cap and more chance for the cut to have enough gaps to let the smoke airflow nicely. Just make small cuts in star shapes till you have enough cuts that you feel are enough. Using your teeth is one way of cutting your cigar without a cigar cutter that you should never ever use. Your teeth are not sharp enough and are not centered at one edge to make that cut. Plus you will end up with tobacco in your mouth which will ruin your taste buds along with that you will most probably end up unwrapping the cigars due to constant pulling and fixing that the whole cigar will be ruined. You will have to have some sort of magical teeth for this method to work, and unless you have that you will most probably end up tearing the cigar from the cap, which will then unwrap the entire thing while smoking. Also and I can’t emphasize this enough, you will have a lot of tobacco in your mouth. That was our guide and methods on how to cut a cigar without a cigar cutter. Whatever happens know that using your teeth will be the worst way to cut and if you have time and some money invest in a small punch that you can carry around with you all the time. Previous articleWhat is a Stogie? Next articleRight Cigar Holders For Golf And More!